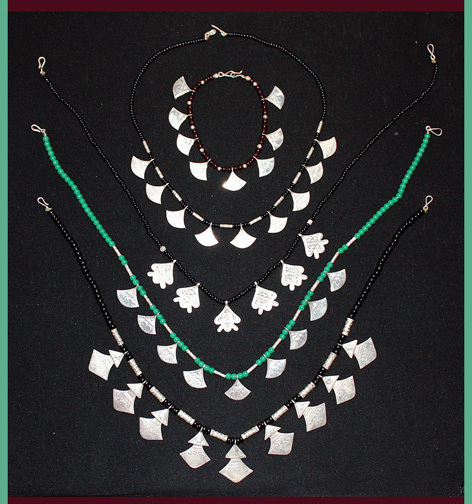 Tuareg jewelry design varies from one Tuareg province to another. Tradition, individual preference and social levels often dictate the specific unique styling of each region. One commonality among the Tuareg jewelers is the use of silver. Silver is the metal of choice for desert dwellers. Silver is considered to be pure, a talisman of good luck and it is believed to be the metal of the “Prophet.“ The item on display is a trademark of the Ullimeden group of Tuareg. The fine necklace with geometrically shaped silver pendants, called tchatchat, are worn traditionally by women and girls. The pendants are abstract representations of Saharan clay dolls with fat bottoms and open arms that symbolize fertility. The tchatchat are interpersed between well formed beads and silver cylindrical dividers called 'Ismana'. These are very attractive, well crafted selections of pure African silver. Each item is over 12 years old. Tchatchat Necklaces: Shat Shat Necklace "E"
Tchatchat Necklaces: Tchatchat Necklace "C"